STORRS - The first significant playing time of Sidney Wilson’s college basketball career came with some obvious positives. 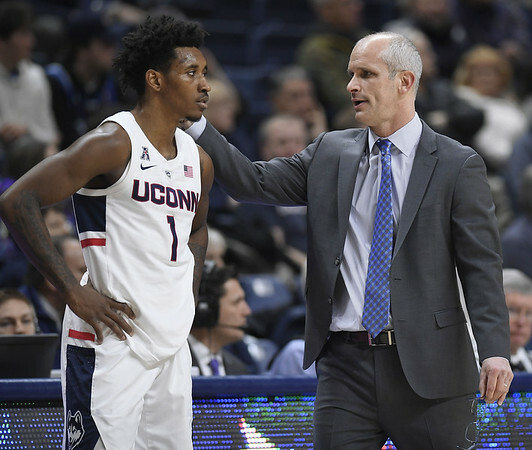 The UConn redshirt freshman forward had five quick points, including his first 3-pointer, and absorbed a charge in his first few moments on the court Sunday against Arizona. But the 6-foot-7 native of the Bronx, who sat out the entire 2017-18 season after transferring from St. John’s and the first six games this season due to a suspension, gave as much as he took against the Wildcats. “The good thing about Sid was he got us five in that first half. But then when we go back and watch the film I think he gave up seven. So he ended up being minus-2 there,” UConn coach Dan Hurley said with painful smile. In what was the second game of his college career, Wilson finished with seven points and two rebounds in 12 minutes of action. An obviously skilled offensive player, Wilson appears capable of helping the Huskies in their quest for a return to prominence. But Wilson obviously has some work to do in order to improve his defense, something he’s aware of. Missing a month’s worth of games clearly set Wilson back a bit in his bid to become a regular in Hurley’s rotation. The coach says he’s only now getting the full treatment during practices. Against Arizona, Hurley saw some defensive lapses from Wilson that limited his playing time. Rotating to find those open shooters and knowing how the Huskies plan to defend the pick-and-roll each night will be key for Wilson. UConn has been playing a smaller lineup for much of the season, meaning Wilson will essentially be a power forward for some of his time on the court. And he’ll have a variety of defensive assignments. “He wants us to be able to switch one through four. I’m the four-man so I have to help that way,” Wilson said. Posted in The Bristol Press, UConn on Wednesday, 5 December 2018 21:17. Updated: Wednesday, 5 December 2018 21:20.